Santa Monica Press, 9781595800930, 160pp. 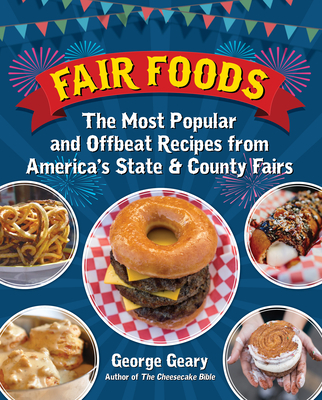 Fair Foods is an illustrated cookbook featuring the recipes of the most popular and offbeat food served at state and county fairs across the USA. Packed with 120 original recipes created by award-winning chef, best-selling author, and renowned educator George Geary, Fair Foods includes such state and county fair classics as Texas Maple Bacon Donuts, The World's Gooiest Cinnamon Rolls with Cream Cheese Frosting, Aztec Hot Chocolate, Witch's Brew, Caramel Kettle Corn, Fried Sweet Potato Sticks, Ten-Pound Cheesebuns, Cheesecake on a Stick, Chocolate-Encased Bacon, Fried Coca-Cola, Fried Guacamole, Fried Oreo Cookies, BBQ Turkey Legs, Bacon-Wrapped Chicken and Waffles, Blue Ribbon Chili, Pork Chop on a Stick, and Spicy Peanut Butter and Jelly Burgers. Each page in Fair Foods is lavishly illustrated with both vintage and contemporary photographs of America's most beloved fair foods, as well as fun and lively images of rides and attractions and nostalgic ephemera. Fair Foods is not only mouthwateringly addictive, it also captures the joy and spirit of America's greatest state and county fairs. George Geary is an award-winning chef, best-selling author, and renowned educator. A former pastry chef for the Walt Disney Company, Geary is a Certified Culinary Professional, and was recently chosen as the Culinary Educator of the Year by the International Association of Culinary Professionals. He is perhaps best known for creating all of the cheesecakes for The Golden Girls and other top-rated television programs. Geary has worked as a critic and/or judge for ABC's The Taste with Anthony Bourdain, The American Baking Competition with Jeff Foxworthy, Hell's Kitchen, Supermarket Superstar, and many other popular television shows. He also teaches cooking classes aboard Holland America Lines. For over thirty years, Geary has been a culinary contest judge for major food manufacturers such as Canola Producers, Veg-All, Hormel Foods, the Hershey Company, Knott's Berry Farm Foods, Ghirardelli Chocolate, Fleischmann's Yeast, the San Diego Union Tribune, ABC News, and many more. From 1982 to 2010, George was the culinary coordinator of the Los Angeles County Fair. Geary is the author of L.A.'s Legendary Restaurants, as well as nine cookbooks including The Cheesecake Bible, The Complete Baking Cookbook, and 125 Best Cheesecake Recipes. He is presently the featured chef on the San Diego Living television show on the CW Network. Geary lives in Los Angeles.